Note: To celebrate the 40th anniversary of the Apollo 13 mission, for 13 days, Universe Today will feature “13 Things That Saved Apollo 13,” discussing different turning points of the mission with NASA engineer Jerry Woodfill. Going to the Moon was big. It was a giant stride in doing what had once been thought impossible. Initially many scientists and engineers had big plans for huge rockets akin to the ships imagined in science fiction: one piece vehicles that took off from Earth, landed intact bottom down on the Moon and had the ability to launch again from the lunar surface. But other rocket engineers had different ideas, and this caused some big arguments. The method of going to the Moon that eventually won out used — in part — a little lunar lander. This decision ended up being instrumental in saving the crew of Apollo 13. And that was big. There were three different methods to choose from in reaching the Moon. One, called the Direct Ascent Mode, would have used the big Flash Gordon-like enormous rocket – which was known as a Nova class rocket –to fly straight to the Moon, land and return. Second, the Earth Orbital Rendezvous technique called for two not-quite-as big Saturn V boosters to launch and rendezvous in Earth orbit. In this mode, one rocket would carry a single Apollo vehicle and its crew, and the other, more fuel, which would be transferred to Apollo in Earth orbit, and then the spacecraft would head off to the Moon. The third option was Lunar Orbit Rendezvous which used only one three-stage Saturn V booster, and split the Apollo vehicle into two separate vehicles – a combined Command and Service Module (CSM), and a Lunar Module (LM). Those familiar with NASA history know that Lunar Orbit Rendezvous was the final choice. But this mode wasn’t an obvious choice, said NASA engineer Jerry Woodfill. Houbolt said it turned into a two-and-a-half year fight to convince people, but he and his team had the facts and figures to back up their claims. No one flipped a coin, but the story demonstrates the intensity of the debate. Woodfill said the Nova rocket may have proved to be the best choice except for the failure of just one of those 30 engines at launch. “This would unbalance the entire assemblage,” Woodfill said. And twice in 1969 – one occurring just weeks before the scheduled launch of Apollo 11 — the Soviet N-1 booster exploded at liftoff. The huge rocket proved to be too complicated, while the Lunar Orbit Rendezvous method had a simple elegance that was also more economical. The bold move paid off, and Seamans saw to it that NASA took a closer look at Houbolt’s design, and surprisingly, it soon became the favored approach – after a little debate..
Houbolt’s design separated the spacecraft into two specialized vehicles. This allowed the spacecraft to take advantage of the Moon’s low gravity. The lunar lander could be made quite small and lightweight, reducing bulk, fuel, and thrust requirements. When the oxygen tank in Apollo 13’s Service Module exploded, the Lunar Module “Aquarius” played an unexpected role in saving the lives of the three astronauts, serving as a lifeboat to return the astronauts safely back to Earth. Additionally, its descent stage engine was used for propulsion, and its batteries supplied power for the trip home while recharging the Command Module’s batteries critical for re-entry. And with ingenuity of Mission Control the LM’s life support system – which was originally designed to support two astronauts for 45 hours, — was stretched to support three astronauts for 90 hours. Imagine, Woodfill said, if Apollo 13 had been a single vehicle employing the Direct Ascent approach. “After the explosion and subsequent loss of the fuel cells, only those entry batteries would have been available to sustain life. Their life, even if all systems except life support, were turned off would be less than 24 hours. And Lovell, Swigert and Haise along with Apollo 13 would return to Earth on that “free-return-trajectory” being cremated in the fiery heat of reentry. But for the clever Lunar Orbit Rendezvous approach, Apollo 13 would have been a casket. Instead, its lunar lander became a wonderful lifeboat” Woodfill said. Listen to an interview of Jerry Woodfill on the 365 Days of Astronomy podcast. A Hollywood movie depicts three astronauts who survive an accident in space, but their lives hang in the balance as the people in Mission Control at NASA work night and day to figure out a way to bring the spacefarers home safely. “Marooned” starred Gregory Peck as a Gene Kranz-like flight director, David Janssen as head of the astronaut office (who looked strikingly like the real Chief Astronaut Deke Slayton), with Richard Crenna, James Franciscus, and Gene Hackman as the astronauts. Like the movie “Apollo 13,” “Marooned” dealt with three astronauts stranded in space, but was an adaptation of a 1964 novel of the same name by author Martin Caidin, and not a real-life portrayal. The novel told the story of a single astronaut in a Mercury-like capsule, but the movie was adapted to reflect the current-day Apollo program. “Marooned” won an Oscar award for Best Special Visual Effects, but when the movie “Apollo 13” received an Academy Award for Best Screen Adaptation, Caidin joked that he should have received the award for scripting the movie in his novel a quarter century before. Woodfill recounted how back in early 1970, he heard about the movie “Marooned” and that the flight directors at NASA were invited to a special screening of the film, and later, the Apollo 13 crew came to a special release and public viewing of the movie. But most of the people who worked in Mission Control and the Mission Evaluation Room couldn’t afford to go see the movie. The viewing was at a plush theater on Richmond Avenue in Houston in January of 1970. “Marooned” made it to the $1.25-a-seat theater by the week of Apollo 13’s rescue, and several NASA employees went to see it, including Woodfill’s colleague and electrical engineer Art Campos, who is now deceased. Jerry Woodfill and Art Campos (among others) in the MER. Image courtesy Jerry Woodfill. Campos went to see “Marooned” the evening of April 13, 1970, and later told Woodfill he was thinking about the movie as he returned home and went to sleep, and wondered about a problem faced by the astronaut actors regarding the emergency batteries, which had been depleted. Just a couple of hours later, Campos was awakened by a phone call informing him that the Apollo 13 spacecraft had suffered an accident, and that he needed to come in immediately to work on a way to get power to the emergency batteries in the Command Module, required for reentry. And in fact, Woodfill said, in the simulators, it didn’t work. The computer in the simulator refused to allow the procedure, but nevertheless, there was no other alternative. So, they tried it in space and it actually worked to re-charge the batteries in the Command Module. “I really think “Marooned” was the catalyst for Art remembering this wire,” said Woodfill, although we’ll never know for sure. Video clip from NASA footage. Art Campos is among the engineers shown in the MER. •	The use of simulators is almost identical to that which Apollo 13’s ground team used in the course of the rescue. •	Gregory Peck’s character announces, “Every resource of NASA and our industrial contractors is being used to the fullest extent,” similar to what was done during the real Apollo 13 drama. •	Press conferences in the movie were similar to those conducted by Chris Kraft for the Apollo 13 media coverage. •	The “Marooned” crew wrongly thinks they may have suffered a meteor strike as did the crew of Apollo 13. •	A hurricane threatens the rescue as was the case with Apollo 13. Even the weathermen wrongly predict its course as did the Apollo 13 meteorologists. •	Commanders of both “Marooned” and Apollo 13 are named Jim. •	The threat of consumables running out is dealt with in the same fashion as Apollo 13 with severe conservation measures being utilized. •	The medics in “Marooned” express concern for the crew’s sleep deprivation as did Apollo 13’s doctors. •	The “Marooned” crew is told to shut down fuel cells 2 and 3, using only fuel cell 1. This is what the Apollo 13 flight controllers experienced as a result of the oxygen tank explosion, two fuel cells shut down with only one sustaining power, until it, too, was lost. But perhaps, said Woodfill, the most notable of “Maroon’s” correlations with the Apollo 13 rescue had to do with those reentry batteries discussed above, and this earlier article in the “13 Things That Saved Apollo 13” series. The batteries were used during the time the ground team was confused about the source of Apollo 13’s explosion. This severely depleted them, and without enough power to the Command Module, reentry could be fatal. These batteries normally were to be used only during the mission’s final hours to power the reentry capsule. Woodfill said that Apollo EECOM John Aaron commented recently at an Apollo 13 anniversary event at Johnson Space Center that he has reflected on how he allocated power from the those batteries to various system managers. He had refused a request for 2 amps from a DOD official wanting power for to light a rescue beacon to locate the crew capsule in the ocean. Indeed, Campos’ contribution was huge, and Woodfill believes the procedure to recharge the batteries saved Apollo 13. It’s the handy man’s secret weapon, and has become a must-have item for astronauts, too. While duct tape alone didn’t save the Apollo 13 crew, it certainly would have been difficult for them to have survived without it. Even though the accident which crippled the ship took out the two main oxygen tanks in the Service Module, having enough oxygen really wasn’t an issue for the crew. A big problem was having too much carbon dioxide (CO2), which came from the astronauts’ own exhalations. 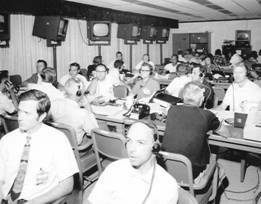 The Mission Evaluation Room for Apollo. Image courtesy Jerry Woodfill. “Any of us in the Mission Evaluation Room (MER) might be called upon to assist in an Apollo 13 ‘solution,’” said Jerry Woodfill, who helped design and monitor the Apollo caution and warning systems. The MER was where the spacecraft systems engineers were stationed during a mission, and should a problem arise on any Apollo mission, the “MER-men” were called on for expert advice. For that reason, Woodfill said he felt privileged rather than frightened when summoned to Arabian’s private office to discuss the threat to the lives of the Apollo 13 crew, the build-up of CO2 in the spacecraft. Woodfill had worked with the environmental system engineers to establish an alarm level based on the percentage of CO2 in the cabin atmosphere. The idea was to use the warning system as an alert for changing the filters. Woodfill had the information on the calibration curves with him, and together, he and Arabian carefully studied it based on the known cabin pressure, the voltage output from the CO2 transducer and the voltage level at which my warning electronics initiated the alarm. “Yes, the warning system was telling the right story,” Woodfill said. But there was a problem with the CO2 “scrubbers,” the lithium hydroxide canisters. The cabin air was fed continuously through environmental control equipment, and the lithium hydroxide reacted with the carbon dioxide and trapped it. Each canister had a life of approximately 24 hours with two men on board. Since there were now three men, that life would be somewhat shortened. The round filters were housed in two separate barrels in the lander. One barrel was plumbed into the cabin’s environmental control system, and the other barrel simply stowed the second cartridge. When the first filter was consumed, the crew simply interchanged the filters in the barrels. Using only the type of equipment and tools the crew had on board –including plastic bags, cardboard, suit hoses, and duct tape — Smylie and his team conceived a configuration that just might work. The biggest challenge was attaching the hose into a funnel-like device having a small round inlet hole for the suit hose and a much larger square outlet attached and surrounding the square filter. But the funnel would most likely leak. Added to that difficulty was the hose and plastic bags tended to collapse restricting the air flow through the filter. Woodfill said that duct tape had been stowed on board every mission since early in the Gemini days. The contraption that Smylie and his team came up with was checked out in the simulators, which worked, and then the team quickly radioed instructions to the crew, carefully leading them through about an hour’s worth of steps. And it saved Apollo 13. The oxygen tanks were specially insulated spherical tanks which held a “slush” of liquid oxygen with a fill line and heater running down the center. Tank Two used for Apollo 13 had originally been installed in Apollo 10, but was removed for modification. In what was considered a minor mishap, O2 Tank Two was accidently dropped and damaged. The two tanks were on a “shelf” in the Service Module and held in place by two bolts. During removal, inadvertently, only one bolt on the shelf was removed, the side that contained Tank Two. When the lifting fixture picked up the shelf, Tank One stayed in place while Tank Two accelerated upward, striking the fuel cell shelf overhead. It only moved about 5 cm (2 inches) but the jolt displaced a loosely fitted fill tube in Tank Two. This tank was replaced with another for Apollo 10, and the exterior was inspected. Since the interior wasn’t inspected, no one knew about the fill tube damage, and the shelf with the damaged Tank Two was installed in the Apollo 13 Service Module (SM-109) November 22, 1968. During pre-flight testing, Tank Two would not empty correctly, possibly due to the damaged fill line. The heaters in the tanks were normally used for very short periods to heat the interior slightly, increasing the pressure to keep the oxygen flowing. It was decided to use the heater to “boil off” the excess oxygen, requiring 8 hours of 65 volt DC power. This probably damaged the thermostatically controlled switches on the heater, designed for only 28 volts. The Apollo 13 review board came to the conclusion that the switches welded shut, allowing the temperature within the tank to rise to over 538 degrees C (1000 degrees F). The gauges measuring the temperature inside the tank were designed to measure only to 80 F, so the extreme heating was not noticed. The high temperature emptied the tank, but also resulted in serious damage to the Teflon insulation on the electrical wires to the power fans within the tank. When the tanks were put into the Apollo 13 spacecraft, the damaged Tank Two was placed in the exterior position. Should the flawed tank have been the inner tank, Woodfill said, its explosive force would have taken with it the sister O2 tank amplifying the force of the explosion, just as using two sticks of dynamite instead of one, the destruction would be a magnitude greater. When the Apollo 13 crew jettisoned the crippled Service Module as they approached Earth, they saw the extent of the damage from the explosion of an oxygen tank. “There’s one whole side of that spacecraft missing!” Jim Lovell radioed to Mission Control, his voice reflecting his incredulousness at seeing the damage of a 13-ft panel blown off the spacecraft. However, the situation could have been more dire. The heat shield on the Command Module could have been damaged. What’s more, NASA engineer Jerry Woodfill said that instead of the panel blowing out, the explosion could have — and maybe should have –severed the Command Module from the Service Module. Photos taken by the Apollo 13 crew after the service module was jettisoned in preparation for the command module’s reentry via the heat shield revealed that not only was the panel missing from the side of the spacecraft — blown into the vastness of space by the exploding pressure of the detonating oxygen – there was also damage to the Hi Gain Antenna, at the right of the vehicle drawing above, indicating the panel had catapulted into space, striking the antenna. What the images couldn’t show, and what the Apollo 13 crew couldn’t see was if there was any damage to the Command Module’s heat shield. Woodfill said concern was voiced in Mission Control that shrapnel from the exploding tank had entered the tunnel, and perhaps ultimately caused damage to both the heat shield and main engine. The main engine wasn’t the biggest issue, as the crew was able to use the lunar lander’s descent engine. (see our previous article , “Using the LM for Propulsion.”) But there was only one heat shield, and it had to work to enable the capsule and the crew to survive the fiery reentry through Earth’s atmosphere. Thankfully, as it turned out ,the heat shield wasn’t damaged. But almost miraculously, Woodfill said, the command module and service module remained connected following the explosion, while the internal pressure of the explosion rocketed the exterior panel into space. Since there is no air pressure in space, Woodfill explained, the force which held the vehicles together was the strength of their mechanical attachments. Yet, it did not. Why? “Apparently, the presence of ‘tankage’ and other structure acted to mitigate and dissipate the sudden pressure spike before it reached the interface between the vehicles,” Woodfill said. “However, if a shard from the exploded O2 tank 2 had punctured any of the adjacent tanks, likely a secondary explosion of any of them would have propagated both the explosion and build up of pressure. In that event, certainly, the vehicles would have experienced either a fatal separation or fatal damage to the heat shield. A piece of shrapnel did fracture the plumbing between the oxygen tanks that allowed the oxygen to leak out of Tank 1, causing the complete loss of power in the Command Module, for without oxygen the fuel cells couldn’t work. Some may say that having the Service Module attached to the Command Module wasn’t important – it was just dead weight anyway. However, other problems could have developed without the Service Module attached, according the Apollo 13 Failure Report. Having the heat shield exposed to low temperatures for a long period could have damaged it, and internal Command Module thermal problems could arise if the Service Module was jettisoned too early. Additionally, flight control problems were anticipated if the Command Module wasn’t attached. The immediate loss of the Service Module would have meant immediate loss of the residual power from the fuel cells while the crew and mission control wrestled to understand the problem. This would have required a much greater power drain on those emergency batteries to the extent that one wonders if the later “trickle-charge” from the lander’s batteries would have been sufficient for reentry. Of course, since the Service Module was jettisoned before the crew re-entered (and the SM itself later burned up in the Earth’s atmosphere) no one could do any “forensic analysis” or an engineering “autopsy” on that part of the spacecraft. “To me, it is amazing that, one, the heat shield wasn’t damaged from the explosion, and two, the connection that could withstand higher pressure ended up blowing, while the weaker connection stayed together,” said Woodfill. But those were among the many things that saved Apollo 13. It’s hard to chronicle any of the Apollo flights without mentioning the Apollo 1 fire. And while many believe the Apollo program perhaps wouldn’t have succeeded without that disaster, the sacrifice made by Gus Grissom, Ed White and Roger Chaffee definitely saved the crew of Apollo 13. On January 27, 1967, during a test on the launch pad with the crew on board, tragedy struck when a flash fire started in the command module. 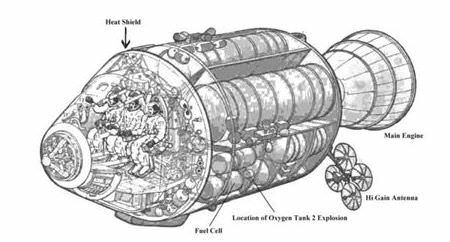 With the pure oxygen environment inside the capsule, the fire quickly proved fatal for the crew before they or workers at the launch pad could get the hatch open. Although the ignition source of the fire was never conclusively identified, the astronauts’ deaths were attributed to a wide range of design and construction flaws in the early Apollo Command Module. The manned phase of the project was delayed for twenty months while these problems were fixed. The irony of the whole situation involves the hatch. Following Gus Grissom’s near fatal drowning when his Mercury capsule sank, the Apollo hatch had been redesigned to avoid the kind of unexpected actuation thought to have caused Grissom’s “Liberty Bell 7” to sink. NASA fire-proofed all future Apollo vehicles with non-flammable materials, used a pad atmosphere of a nitrogen/oxygen mix, and coated of all electrical connections to avoid short-circuits. Diagram of the Apollo Command Module control panel. Credit: NASA History Office. Click for larger version. Woodfill said when Apollo 13’s switches were activated for reentry, the interior would surely have burst into flame, were it not for the fireproofing. Condensed water droplets might have short-circuited panel switches, circuit breakers, and connector wiring. Apollo 1 and the fireproofing of future Apollo spacecraft prevented such an event. A favorite quote of many managers of the Apollo program, Woodfill said, is from President Theodore Roosevelt, the one posted at the top of this article. But later, it allowed for great triumph with the success of the Apollo program, and a defying of the odds of the Apollo 13 crew’s survival. But the explosion of the tank had enshrouded the Apollo 13 spacecraft with debris. Commander Jim Lovell and his crew couldn’t discern the stars from the particles that glimmered in the sunlight. “The situation was, without the ability to see the stars, you couldn’t navigate,” Woodfill said. But NASA had a backup navigation plan, thanks to an insightful NASA contractor employee. This novel way of navigating had only been tried once before in space. And coincidentally, the astronaut who used it was Jim Lovell, during his previous flight — Apollo 8 — which orbited the Moon in December of 1968. The nominal flight plan for a mission to the Moon. Credit: Apollo 13 report. The terminator is the line which delineates between night and day on Earth; where the Sun is shining and where it is dark. Woodfill’s friend figured out the geometry and wrote a computer program to validate the idea. He submitted the proposal to the navigation board, which approved the technique so that it was entered into the computers in the Mission Control Center. Through unusual, and what could be called happenstance circumstances, Lovell experimented with the backup plan during Apollo 8. Lovell served as navigator for the first manned mission to orbit the Moon. He made a star sighting in preparation for the return to Earth, and entered the coordinates into the Apollo spacecraft’s primitive computer using the “DSKY” (display and keyboard). Instead of pressing the ENTR (enter) key, he inadvertently pressed the adjacent CLR (clear) key erasing the entire navigational alignment. Initially, the Apollo 13 crew was able to use the Sun as a “marker” to help in guiding the spacecraft to confirm they were on the right path, and were able to fire the LM engines for course corrections using the transferred guidance platform from the Command Module. But as Apollo 13 headed back to Earth, the Reentry (RETRO) and Guidance, Navigation and Control (GNC) officers looking at the trajectory analysis noticed the spacecraft was coming in too “shallow,” that is, Apollo 13 was headed to skip off the atmosphere and out into space forever. Something seemed to be “blowing” the spacecraft off course. Later, it was discovered that cooling vapor from the lander was responsible. Since no lander had been present for previous missions on a return trip from the Moon, such a mysterious “wind” had never been encountered prior to Earth re-entry. Another burn was needed, but no help from the guidance system would be available, as powering the lander’s guidance system, its gyros, the computer, etc. would use too much electrical power. Here’s where the backup navigation approach that Lovell experimented with on Apollo 8 came to the rescue. “If a ‘dead-reckoning’ approach could be used, no electricity would be needed,” said Woodfill. “Simply point the vehicle correctly, start the engine and stop it based on Mission Control’s prescribed time for its operation.” Lovell eyed up the Earth’s terminator line and controlled the “yaw” of the spacecraft, Haise controlled the “pitch” and Swigert timed it with his accurate Omega Speedmaster watch. Graphics from the Apollo 13 report on using Earth's terminator for navigation. Navigation graphics from the Apollo 13 report. Woodfill said he enjoyed Hollywood’s re-enactment of the procedure in the “Apollo 13” movie. Though the spacecraft gyrations about the heavens are wholly exaggerated, the scene where Tom Hanks, Bill Paxton, and Kevin Bacon set-up and execute the terminator burn is generally accurate. Suffice to say, the procedure worked for Hollywood dramatics, but more importantly, it worked to save the lives of Lovell, Haise and Swigert. While oxygen tank number two on the Apollo 13 spacecraft was an accident waiting to happen, another problem on the Saturn V rocket could have destroyed Apollo 13 before it reached Earth orbit. During the second-stage boost, the center – or inboard — engine shut down two minutes early. The shutdown wasn’t a problem, as the other four engines were able to compensate for the loss by operating for an extra four minutes. But why the engine shut down is a mystery that may have saved the mission. Woodfill said that the quick assessment in Mission Control was that a minor electrical signal failed to keep the engine operating so that it shut down prematurely. But that wasn’t the problem. What happened was the Saturn V rocket experienced dangerous so-called “pogo” thrust oscillations, a problem NASA knew about. While a fix had been planned for Apollo 14, time did not permit its implementation on Apollo 13’s Saturn V.
The Saturn V rocket had five J-2 engines, each producing 200,000 pounds of thrust, together creating the 1 million pounds of thrust needed for a mission to the Moon. On previous Saturn flights, these pogo oscillations had occurred during launch. The phenomenon occurred as the fuel lines and structure of the rocket resonated at a common frequency. The resonance tended to amplify in force and potential destruction with each bounce of the “pogo” mechanism. So damaging was the phenomena on the unmanned Apollo 6 mission that an entire outer panel of the Saturn 5 ejected into space. Woodfill said if Apollo 13 had ended up in that type of orbit, it would have been bad but not fatal. However, Apollo 13 was a much different situation than Apollo 6. The Apollo 6 mission carried a mock lunar lander of more modest mass than the “full-up” lander which Apollo 13 carried to orbit. With the added mass for Apollo 13, the pogo forces were suddenly a magnitude greater in intensity. A mission report said that the engine experienced 68g vibrations at 16 hertz, flexing the thrust frame by 3 inches (76 mm). What shut the engine down? “It is, to this day, not fully understood, but it had something to do with fooling the engine’s thrust chamber pressure sensor that pressure was too low,” said Woodfill. He has studied the mission report, but says the complete analysis of why the engine shut down isn’t included. 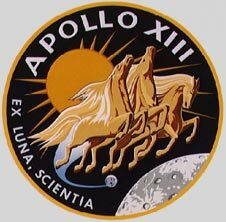 As it was, the engine shutdown likely saved the Apollo 13 mission. Just 72 hours before the scheduled launch of Apollo 13, Ken Mattingly was removed from the mission and replaced by Jack Swigert from the back-up crew as Command Module Pilot. Charlie Duke, also from the back-up crew caught the measles from one of his children, and exposed Mattingly — the only other member of either the prime or back-up crews who were not immune to the disease. If Mattingly were to come down with the measles, he might contract it while alone in the Command Module while Jim Lovell and Fred Haise were walking on the Moon. Although, ironically Mattingly and Duke flew together later on the Apollo 16 mission, were it not for Charlie Duke’s measles, Woodfill said that Swigert’s special talents for an Apollo 13-type mission would not have been present. First of all, his physique was better suited to the harsh conditions he experienced in the inoperable Command Module, where he was positioned for most of the flight. Woodfill said that likely, Swigert’s brawn as a former University of Colorado varsity football player better served him to withstand the cold conditions and endure the small amounts of water that the astronauts had to ration among themselves. Water was one of the main consumables – even more than oxygen – of which the crew barely had enough. But more importantly were Swigert’s familiarity with the Command Module and his “precise” personality. And, equally important, said Woodfill, was the talent Haise brought to recording and rewriting operational procedures. “Fred had been a newspaper stringer for a small newspaper in Mississippi in his youth, taking notes and editing them for his local Mississippi paper’s stories. Utmost among reporters is accuracy in quoting sources. Those transmitted words from mission control had to be flawlessly transcribed if the crew was to survive, and Fred and Jack did an amazing job. Of course, those familiar with the Apollo 13 story know that Ken Mattingly never got the measles. But the role he played in getting the astronauts back home safely can’t be overestimated.